- Chicago Fire (3x17/s03e17) [+] [+] [+] [+] [+] [NBC]. - The Voice (8x06/s08e06) [+] [NBC]. - Marvel's Agents Of S.H.I.E.L.D. (2x12/s02e12), Who You Really Are [+] [+] [+] [+] [+] [+] [ABC]. - Fresh Off the Boat (1x08/s01e08) [+] [+] [+] [+] [+] [abc]. - Repeat After Me (1x04/s01e04) [+] [abc]. - Hell's Kitchen [US] (14x02/s14e02) [+] [+] [+] [FOX]. - The Mindy Project (3x19/s03e19) [+] [+] [+] [+] [FOX]. - NCIS (12x17/s12e17) [+] [+] [+] [+] [+] [CBS]. - NCIS: New Orleans (1x17/s01e17) [+] [+] [+] [+] [+] [CBS]. - Person of Interest (4x17/s04e17) [+] [+] [+] [+] [+] [+] [CBS]. - Justified (6x08/s06e08), Dark As a Dungeon [+] [+] [+] [+] [+] [FX]. - Cougar Town (6x10/S06e10) [+] [+] [+] [+] [tbs]. - Switched at Birth (4x10/s04e10) [+] [+] [+] [ABC Family]. - Pretty Little Liars (5x23/s05e23) [ABC Family]. - Face Off (8x09/s08e09) [+] [+] [SyFy]. - Tosh 0 (7x04/s07e04) [+] [+] [+] [Comedy Central]. - Swamp People (6x06/s06e06) [+] [HISTORY]. - Unwrapped 2.0 (1x06/s01e06) [Cooking Channel]. - Love and Hip Hop: New York (5x12/s05e12) [+] [+] [+] [VH1]. - Bear Grylls Breaking Point (1x02/s01e02) [+] [+] [Discovery Channel]. - Being Mary Jane (2x06/s02e06) [+] [+] [+] [BET]. - What on Earth? (2x05/s02e05) [+] [Science]. - Welcome To Sweetie Pie's (5x02/s05e02) [+] [OPRAH WINFREY NETWORK]. - RuPaul's Drag Race (7x02/s07e02) [+] [LOGO TV]. 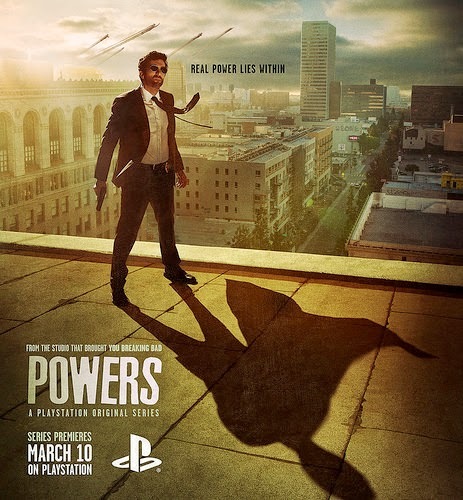 - Powers  (1x01/s01e01) [+] [Playstation Network]. - Uncle (2x05/s02e05) [+] [+] [BBC Three]. - I Survived A Zombie Apocalypse (1x04/s01e04) [BBC Three]. - World's Toughest Jobs (1x03/s01e03) [+] [+] [BBC Three]. - Bargain Fever Britain (1x02/s01e02) [+] [itv]. - Critical [UK] (1x03/s01e03) [+] [+] [sky 1]. - David Attenborough's Natural Curiosities (3x06/s03e06) [+] [+] [WATCH]. - 10,000 BC (1x10/s01e10) [+] [Channel 5]. - Schitt's Creek (1x10/s01e10) [+] [+] [+] [+] [CBC].